Agram is a Croatian flagged luxury charter yacht built by the Dutch shipyard Heesen and launched in 2008, with an extensive refit in 2016. 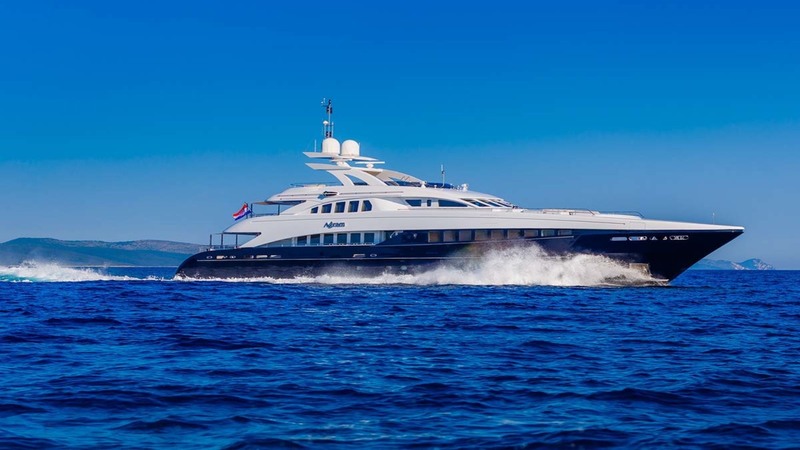 Her sleek and sporty exterior and elegant, airy interior are designed by Omega Architects and the Heesen in house Team. She boasts three decks, a spacious salon on the main deck and a sky lounge as a second salon. She offers an amazing seating area on the fore deck and her spacious sundeck is equipped with a Jacuzzi, sun pads, a bar, BBQ and dining area. She can comfortably accommodate up to twelve guests in five staterooms plus a convertible cabin. Agram can accommodate up to twelve charter guests in five + one convertible and air conditioned staterooms. The full beam master stateroom is based on the main deck forward of the salon and features a king size bed and a large en-suite equipped with a Jacuzzi tub and separate shower, a small walk-in wardrobe and an office. The two VIP staterooms based on the lower deck feature queen sized beds and en-suites fitted with showers. The two twin cabins can be converted into doubles, each with an en-suite bathroom with showers. Her sky lounge is convertible into a double stateroom with a queen size bed. Agram is equipped with the latest state-of-the-art audio & video systems provided in the salons and the master stateroom such as: Bose sound system, large LCD’s TV’s, SAT TV, Apple TV, WiFi.